I've decided to up stakes and move. I'm not happy in here anymore and I think that's reflected in my lack of posting here recently. So, in order to spark things up, I've decided to call it quits here. Sometimes you just need to start fresh in order to carry on with something you like doing. So that's exactly what I'm doing. I can now be found over at The Mouse Hole on Tumblr. I have no clue why that site decided to lose the 'e' from their name, but it looks nice and shiny. Maybe you can pop round sometime if you're not too busy. Good evening, everyone! It's been snowing here again, so we've got a good covering in time for Christmas. It's lovely out there. I was out walking around listening to The Jethro Tull Christmas Album and it's put me right into the Christmas spirit. Now, I was going to write a big analysis of my year and talk about how interesting it's been in so many ways. I'd written about half of it, in fact. But instead, I'm just going to say that I've had a bloody good year. I've been to some cracking gigs, experienced the best of human kindness (James and Karin, Simon, Rob H, Wilf, John and the rest of Manning - take a bow, chaps) and, in the last month, I've produced something which I'm truly proud of. Something which I actually want to show off to everyone and go "Listen! I did that! Well, not that - I didn't make the sounds, but I made them go left and right like that!" (Just so you know what I'm on about, I mixed the Tinyfish song Nine Months On Fire in 5.1 surround sound.) It's the first thing I've done that I've actually been so happy with. The next step is figuring out just how to get it to people so that they can hear it. Anyway, the point is that I'm proud of it. I'm proud of what I've done this year. And I'm so grateful for all that I have and all that I experienced. I really do know the best people in the world. Have a very Merry Christmas and a hearty, healthy and Happy New Year with all those you love and love to be with. Now, clear off! Merry Christmas Mr. Bean is on and it's not Christmas without that Nativity scene. Cheers! Right, I'll keep this short and bitter. I'm angry right now. I'm very annoyed. Everytime I try to follow up a music idea on Cubase, it falls flat on its face. There are a number of reasons for these constant failures. The main one would be that my incredibly amateur method of recording guitar and/or vocal tracks is long, difficult and, ultimately, yields pathetic and rubbish results. Unfortunately, most of my ideas revolve around guitar work and require those guitar sounds to develop properly. So, I'm putting everything on hold. All of it. Hopefully, in a few weeks, I'll be able to land myself a copy of Windows 7 (f*ck you, Vista! ), Pro Tools and something which will allow me to record sodding guitars directly into a sodding project session. I've been trying all summer to work around my problem, and I have got some results (Nine Months On Fire, Grendel - go to the Bandcamp site to find out about that one), but it's not enough to get a blueprint of what I want to create into some demo form. That's it. Now, I'm going to bugger off and read a book, or something. Goodbye for now, and may your god go with you. What-ho! I'm actually holidaying at the moment in deepest Suffolk, but I've found a smidge of temperamental Internet, so I thought I'd come here and update you on some interesting news. First up, I've got a new project on the go. I'm working on an EP called Aquaphobia. It'll be about seven songs in length, be no longer than twenty five minutes (ish) and it will carry themes of lonliness and overcoming fear, all with an aesthetic backdrop of the ocean. The first track, an intro piece called Shallow Waters, is up on my Bandcamp site right now. The whole thing is due to ebb and flow with change until it feels finished, so it could very well change soon. Indeed, the artwork (pictured above - or, it will be once I can get the f*cking thing uploaded) has already gone through several different versions. I'm quite proud of the one I've got at the moment. You can see that I'm using the logo the wonderful Jim from Tinyfish made up for me because it's too superb to use just the once. I'm hugely grateful for it, and I thank him again for such a fab present. 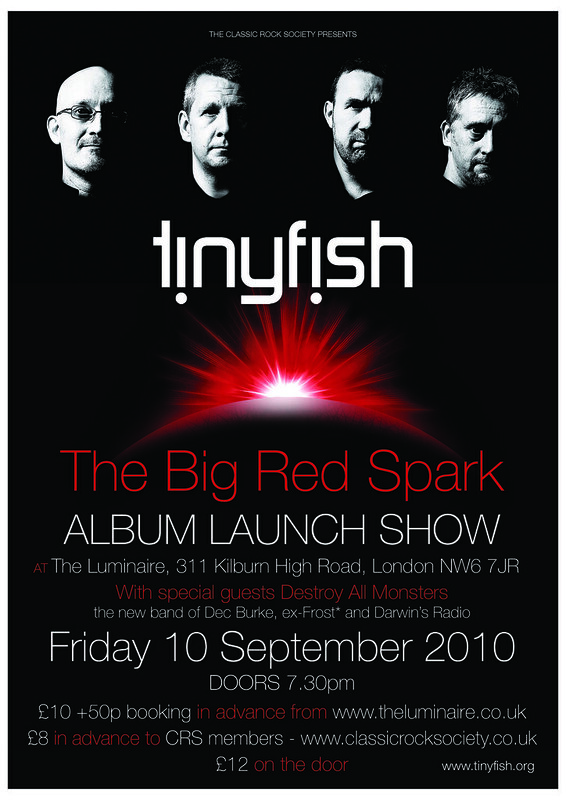 Speaking of Tinyfish, they're finally releasing their second album, The Big Red Spark next month. There's a launch gig, too, which you could very well do to mooch along to and have a bloody great night. If you can't get along, then you can pre-order the thing and have some undoubtedly brilliant music to listen to. Go to it! Second bit if big new now, and the Amazing Wilf (also known as David Elliot), the lovely chap who presents The European Perspective on The Dividing Line Broadcast Network, has approached me to take part in Project Grendel. As some of you may know, Grendel is one of the first Marillion songs written, recorded and released back in the very early 80s. As some of you may know, it's a song that, shall we say, hasn't aged well. As some of you may know, it's become a bit of a joke in progressive rock circles, especially in the Marillo's own camp. Wilf has made it his mission to re-invent Grendel, to regenerate and re-record it for a contempory progressive scene. The project is still in its early stages right now, but it is slowly gathering momentum. And I've been asked to compose an orchestral arrangement for the introduction and first verse section of the piece. I am truely honoured to have been asked to participate in this project, and I will do my best to not let the side down. I'm going to approach it the same way I did the second section of Nine Months On Fire - by just jumping in and seeing what happens. Hopefully, I can create something completely bonkers and out-of-the-field, but still retain some recognisable essence of the original song. With most of the Tinyfish boys also sticking their hands up to be included, it'll be interesting to see how this thing develops, and maybe, just maybe, the dignity of Grendel, if there was any to begin with, will be saved. And at the end of the day, it's a bit of a laugh, isn't it? And that's what you really want from doing this kind of stuff. I feel incredibly lost sometimes. I don't really know what to do, I can only see where I've come from, but I don't know where to go next. The next year's quite sorted, for I'm going to finish my course, turn my Foundation Degree into a BA Honours Degree, have a bloody good time along the way and feel bloody good about myself. ...But then what? Get a job, I suppose. What job? Where? How? Will I do something that I want to do, something that I'll be qualified to do, or something which will tie me over until I can make my break? It's a bit daunting. For all my life up to this point, I've known what to do. It's sort of automatic: school, secondary school, college, then university (or college again in my case, but doing a higher education course). But then what? There are so many different paths to take, and one of them must be taken. The option to carry on as normal is not valid. That's quite scary for someone who doesn't adjust well or quickly to change. I constantly feel like I'm looking at my life with my back turned to the direction in which I'm walking. I honestly can't plan anything further ahead than this next year. I've been like that for the last ten years, believe it or not. I guess everyone goes through these moments, but to be honest, that doesn't exactly make me feel better. No offence. There are a good few people I would love to talk to, too. But, for many reasons (including finances, timing, convenience, and all those boring sorts), that's just not possible right now. The constant reminder that all of these people have lives which are as, if not more, intricate and busy as my own is not a strengthening one. The idea that by continually trying to contact people, I'm just going to annoy them with my consistency. I suppose I just miss people, plain and simple. I've noticed that I've started doing things as well, things that I used to do an awful lot, like constant hand washing, placing and rearranging things into their 'proper places', and the urge not to throw things away. It's been quite a while since I've made my aquaintance with these fellows. I think I've still got quite a few demons lurking here and there. That's good, I've got a lot of time to mull them over before I start college again in late September. Yippee. I tend to go on these night time drives when I enter a night shift. With no-one and the world to distract me, I start to analyse myself. I think I've written here before that that can become a massive problem. So, I just keep on driving, until the day starts to break and I fall asleep. The Sun tends to warm me up again, and the next day is quite different to the night. But that doesn't mean that what I feel on the night is false... Unfortunately, it's also usually at night when I become my most creative, and I start work on numerous ideas which tend to be left unfinished by the time the sky gets light. The recent Tinyfish project was a fine example of how good things can come out of this sometimes troubling period. That doesn't happen often. Is it worth going through these rather bleak moments in order to strike occasional gold and inspiraton? Oh yes, of course it is. Just like how one endures major emotional and personal pain in order to, eventually, enjoy the company of those special few who one is honoured and proud to share one's life with. It's the same philosophy I took when going through the incredibly dark times of the last two years - the low times are worth enduring in order to enjoy those incredibly high moments at the other end. My orchestral work is finished! Yes, my re-working of Tinyfish's Nine Months On Fire was completed at about 03:15 on Wednesday morning. Huzzah! As mentioned before, you can listen to it at my solo Bandcamp site here and you can listen to the original, along with many other equally fine Tinyfish tracks, here. I'm pleased to report that the band want to include it on their website when they redesign it come the release of their new album, which is very nice of them and will look quite nice on my CV. My first piece of 'professional' work? Could be! Wheeee! In other news, I've got plans to assemble a band which will be a sort of predecessor to the Sigma 6 project. I'm still thinking of a band name, something involving whisky and/or barrels, but the general idea is sorted. Bascially, myself and a group of similarly minded music men of fluctuating number, will perform in an acoustic, laid back and relaxed style a few numbers that will be nice to strum and sing. The ideas I've got for Sigma 6 are becoming a bit too big for what I can manage now, and I doubt there's much of a scene for our... 'interesting' brand of Rock music in little humble Hull, so this new band will be a gateway to getting out and getting used to performing in the live realm. The idea that it'll be all relaxed and good natured will (hopefully) mean that little stress will be involved as to whether or not we pull off every song note-for-note and pitch perfect. In short, it'll be practice meets fun. Sounds good, right? OK, that's about it for now. Take care, people. I wanted to experiment with orchestral instruments and sounds. The chance to initially fiddle with flutes and tinker with trumpets was when I was doing the Sound Design project on my Music Production course last term. I instead opted to create a more Electronic soundtrack rather than a traditional Classical sounding one, and so the opportunity passed me by. Though I am very proud of what I produced for that module (I rank it as one of the best pieces of work I've ever done), I was disappointed that I didn't take the plunge into the symphonic realm. So, I decided to dedicate one of my Summer projects to experimenting with these sounds. It would also help prepare me for the third year (starting in September) and it would keep my creativity ticking over. But where to start? How could I really make an effective piece of work? This is where Tinyfish come in. Those who know me will know that Tinyfish are one of my favourite bands. Billing themselves as "the world's smallest Prog Rock band", they are certainly not typical in their Progressive stylings, creating more song-based music and lacking a keyboard player (which many would consider blasphemy to the genre), but this all enhances their craft. And they are all really lovely people, too. Their self-titled debut album contained a track called Nine Months On Fire (click on the link to listen). I often describe the song as a whole feature film in five and a half minutes, telling a story about what could've happened if the "go-ahead, entrepreneurial Thatcherite spirit was applied to the discovery of the occult". As the original is incredibly cinematic, I thought this would transpose well to the orchestral style I was gunning for. And so, after about a week of figuring out various sections of the song, constantly resetting the sounds in Edirol Orchestral to match up with what I'd done the night before, and signing up to the brilliant Bandcamp, I can now present Part 1 of my orchestral version of Nine Months On Fire. I hope you enjoy what I've done. Oh, and you can even download it if you want it to plague your computer for a while. I must say, it's not finished yet. Apart from lacking Part 2, there are still a few sounds that I want to try and find to include, and there are still a few adjustments to be made to the mix, but that's essentially the gist of it. The structure's pretty much done, I think. And I'm rather proud of it. Finally, I'd like to say a big thank you to Jim Sanders, who has provided me with a logo to adorn the artwork that is intended to mirror his own fine work. Thanks, Jimbo! In other news, I think I've got the whole of Amazon checking their stock of the limited edition version of Season 10 of The Simpsons, as the one they sent me didn't have the outer see-through slipcase with it. I like my packaging to be complete, and it just won't fit in the others on my shelf. 1. Any of various small rodents esp. of the family Muridae, usu. having a pointed snout and relatively large ears and eyes. 2. A timid or feeble person. 3. Computing A small hand-held device which controls the cursor on a VDU screen. 4. Slang A black eye.